Never Mind The X-Men, Its X-Mas! At this time of year, black-belts and red puffer jackets are in. However, before you congeal cotton buds for that handcrafted beard, why not consider the loving homemade gifts already for sale? Comics activists including Andrew Geczy and Matt Reynolds here at Alltern8 and others, have already compiled some lists of easy to pick up comics. The independent press offers items offers items cheaper and often so personalised that the recipient knows they’re one of a kind. And how better to have the gift delivered than right from the cartoonist’s own hand? Shopping at fairs, I prioritise picking up the work of Sally-Anne Hickman. Yes, always great value for money. They’re instantly recognisable, emanating sound mellow vibe covers made from wallpaper and glittery stick-ons. Lovely little things, with energetic and youthful scribblings of the author’s comic-book diary, full of character and conversation. In one of my favourites, “Have you got all your cds & things?” we get an honest, fearless and involving tale of a friendship at departure point. These are pocket-size, affordable and lovely graphic novels, all of them. You can email Sally-Anne at sallyshinystars (at)hotmail(dot)com or contact her on Facebook, a link for which can be found alongside some samples at her blog. You should be able to pick up her books for £4 or less. Other than the few sample jpegs obtained for this review, I don’t own any wares made by Richy K. Chandler. How could I recommend them for this special time of the year? Behold! I have seen these up close and they’re every bit of pretty. 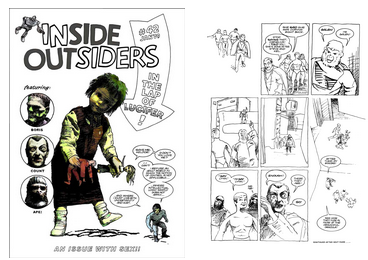 The packaging is professionally crafted and the comics, just as much. Made of Presents! For further details and samples, check out Richy’s Myspace page. The “Cosmically Enlightened Gift Set” costs just £5 and the “Mini-Comic Box Set” is sterling value at £10, plus £2 postage and packing for each. Top tip for a tasteful gift, which is probably too good for High Street shops everywhere. For the Lover of Comedy…. Ralph Kidson is probably the funniest man in comics. He delivers post-modern pondering, one-dimensional veneer built to hide a variety performance showcase, bare visuals carrying superb pacing, concise character expression and obscenities, lots of obscenities. Ralph is a consummate social commentator, a snorting punk, a fantastic lover and I can count the comics of his comics I’ve been disappointed with on two fingers. Indeed. In the abstract narrative within, Smith deals with themes of physics, psychics, play, philosophy and environment. Not bad for a visual instruction only script. Artist Oliver Lambden excels, whipping out strokes of Kirby, Simonson and Moebius in a work that evokes epic qualities of artistic structure. Not only do both creators significantly up their own games, but re-write comics language, stripping away its facade and celebrating it at once. The book is a tidy baige-coloured volume, classy and worked. Affordable stocking filler, definitely ideal for an artist friend. 48 pages, cost approx. £4 from Oliver Lambden. Robbins’ piece is shorter and wordier than Bloc, but equally a thriller. Its written with comedic mischief, multiple definitions, paradox, and clever pace to the proceedings. Visually, its been crafted loyally with full-figure as portrait style, lacing fantasy within reality and functionality. This excellent example for good comics is a bargain at only 1.75 Euros/$2.50 US/£1.50 UK, postage included. Adults only. Available to buy at Blackshapes Shop. The small press has also turned out a few graphic novels of note. Some of these are available in comic shops, but before that, some which aren’t. For the Trad Comics Action Story Fan.. 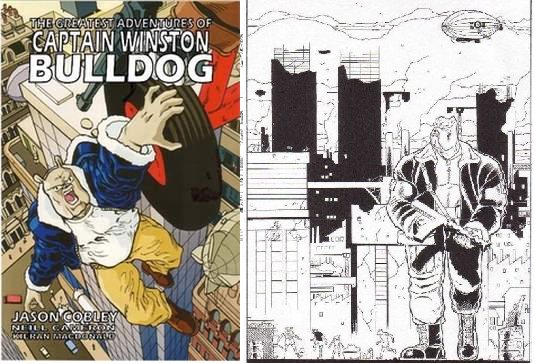 The United Kingdom has had its fair share of larger-than-life comics icons: Dennis the Menace, Roy of the Rovers, Judge Dredd and Captain Winston Bulldog. Over the mid-nineties and this decade, writer Jason Cobley worked with upwards of thirty artists to deliver tales espousing the stiff-upper-lip of Blighty: eccentric, corny, brave and dashing. Alongside his action narrative, illustrators present a highly structured British metropolis, detailed with anthropomorphic and sci-fi scenes as well as stylised minimalist solid designs that are difficult to put down. Some of the strips don’t lend themselves quite so well to the reproduction, but this package is a valuable cultural historical artefact of a generation and an essential reference point in British comics. Simple action dynamics, occasional insightful humanity and some damn fine fun. With a perfect bound full colour cover the complete 208 pages can be purchased for the bargain of £7.99 here. For the Lover of Myth and Legend…. 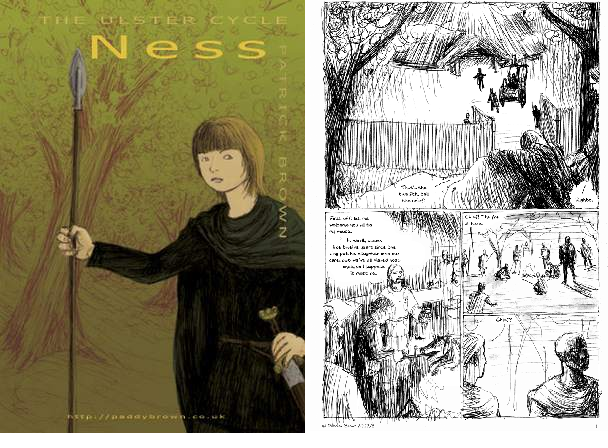 “Ness” is the opening work to Paddy Brown’s “Ulster Cycle” comic, were figures and environment gain dimension through directional pen scores and academic research shifts seamlessly into unafraid working narrative. Daughter of the king of Ulster, Ness goes on the run to track down a murderous outlaw, with a looming war between Ireland’s kingdoms for backdrop. The mythology is complimented by Paddy’s occasional lighthearted anachronisms in the script, but the meticulous adherence to source material makes this a fun educational tool as well as a great old yarn. The A5 graphic novel, collects “the full 72-page story in black and white, plus full colour cover, pronunciation guide and seven pages of notes.” and is well worth the £4.99 (incl. postage for the UK and Ireland) payable through Paypal. Sand and skulls and the disparate wildness of literate West. Daniel Merlin Goodbrey examines contemporary anomalies through the prism of Western genre and computer-aided minimalist projection is that of a modern-day conjurer in this collection of “Tales from an Unfolded Earth”. These tales are sociology: ‘showing’ often only one or two characters, a sense of their connections with an entire society is ominous and eminent. The meta-narratives character studies’ come with personal histories, labour relations and linguistics among flowing sequences and HD coherence. 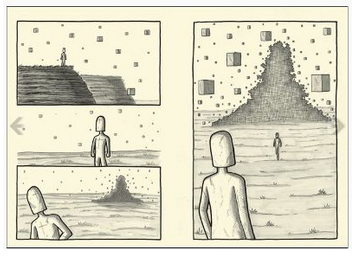 Merlin Goodbrey is best known for his pioneering work on hypercomics, its to his credit that here he accomplishes providence of something with a similar highly personal feel. 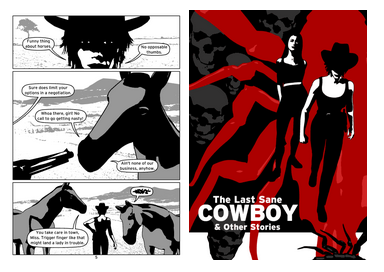 “The Last Sane Cowboy and Other Stories” is a cult classic and £7 or $13 well spent. Its published by AiT/Planet Lar and you can find it on Amazon and other places. Phonogram has re-fuelled my interest in comics, my love towards music and is not only one of the greatest comics being made today but also the simplest. David Kohl is a phonomancer; he uses music to make magic and because he’s a prick sometimes that goes bad. The other main character of this book is Brit-pop, a revivalist movement linked with Kohl’s essence and rewritten, along with natural reality. In writer Kieron Gillen theres all the aspects of a fantastic music journalist, teacher, poet and creative commercial visionary with tolerable arrogance, taking his cue from Moore’s definition of magic. Artist Jamie McKelvie takes his from Grant Morrisson with designer biography sigils, smart, savvy, smug and infuriating characters. Both lads are to be awarded for bringing real, relevant, clever concepts and scenarios to the audience. 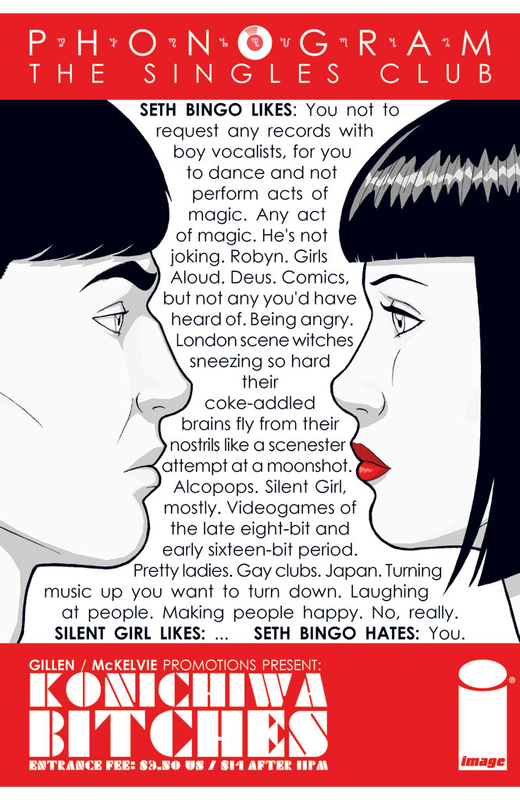 Phonogram Volume 1: Rue Britannia is published by Image and you can pick the collection up for under $10. Enough from me, Go, load up your sleigh!